One of the best – and certainly the easiest – ways to cook eggs for a large number of people is undeniably baking them in a large ovenproof dish. 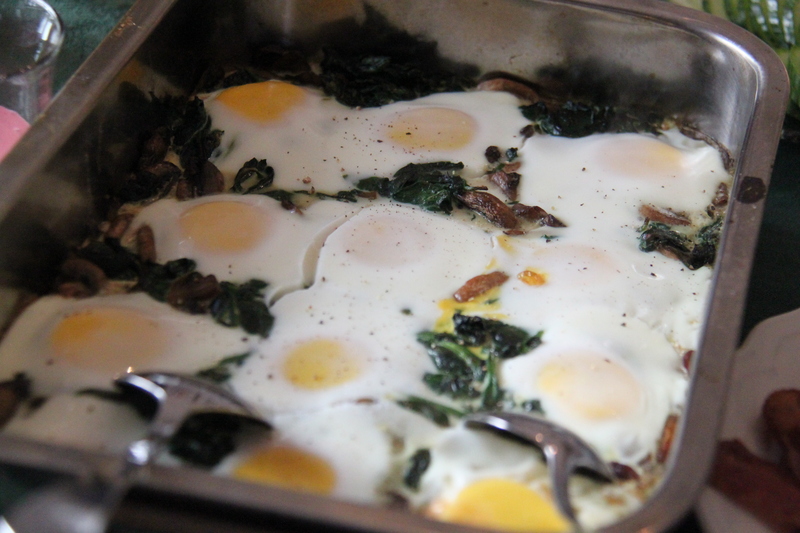 These eggs with wilted spinach and fried mushrooms are really delicious and so very easy to make. I served them at a brunch with crispy bacon (and a smorgasbord of other brunchy things). Rinse and slice the mushrooms. Fry in butter, add salt and pepper. Remove from the saucepan and wilt the spinach in a little butter in the same saucepan. Remove any excess liquid. Grease an ovenproof dish and add the spinach and mushrooms and mix the two. Divide evenly across the dish and make twelve hollows for the eggs. Crack the eggs into the hollows and place the tray in a 200C oven for 10-15 minutes, until the eggs are just set. Add salt and pepper before serving.